While Warren County does not provide an official network of "improved" parks, there are municipal parks and several trail networks known as Natural Resource Areas (NRAs). Similar to the state-owned WMAs, they are minimally improved tracts of land reserved for passive recreational use by the public. Though not well-known, these places provide pristine destinations for family jaunts, hikes full of historical fabric, even the excitement of cave exploration. The Marble Mountain Natural Resource Area is located on the southwestern end of Marble Mountain about a mile north of Phillipsburg. The Highlands Trail leads from here along more than 150 miles of trail to the Hudson River at Storm King Mountain in New York. 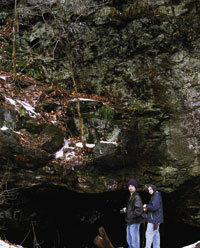 Although only a short portion of the Highlands Trail lies within the Marble Mountain NRA, some determined hikers have already found their way along much of the proposed route for some miles northwest of here, hiking from here along Scotts Mountain to Merrill Creek Reservoir, Buttzville, then northerly along portions of Jenny Jump Mountain and beyond. The trail forks to the left and right. Heading to the left will keep you on the main trail, but taking the trail to the right will lead you to what is commonly called the Ice Cave. After a few hundred feet you will pass a very large pile of loose rock on your left. Someone has spent a lot of time piling some of the loose, flat rocks to make a couple of walls in the base of this huge pile but for what purpose? To your right you'll see yet another low wall constructed of the same type of flat rocks. Finally you reach a large flat open area at the base of this cliff and are amazed to see a huge opening in the base of the cliff. You have reached the Ice Cave! Many people are too young to remember that this is not a cave at all; it was blasted out of the iron-bearing rock that defines it. This was once known as the Fulmer Mine, also called the Marble Mountain Mine. Opened in 1860­­re-explored in 1880 and again in 1886­­ it has been claimed that over 1,000 tons of usable ore were mined, but there is no known record that any of it was actually shipped. Examine the rock walls inside and outside of the opening and you will see much evidence of the tons of rusty iron ore that was taken from here. In fact, the huge pile of rock that you passed on the way up here was blasted out of this space. The cliff in which the opening is located was formed by miners blasting away the side of the knoll, before finally tunneling in to make the "cave". Inside, the Ice Cave is about forty feet wide, thirty feet deep front to back, and ranges from about three to seven feet high. The small "room" to the left of the main room is a bit taller. Probably the same amount of rock was blasted or removed from the knoll in front as was blasted from the mine itself. This formed the flat face of rock at the front of the mine before the miners finally began excavating the rock within, leaving the room as it is today. The side trail that led here continues around to the north, eventually looping back until you are on the top of the mountain directly above the mine. If you continue to the highest point just beyond the surface workings, you will be surprised by the sudden appearance of a huge water tank and be pleased with a great view of parts of Lopatcong and Phillipsburg. Be very careful here because the drop-off is dramatic, at least seventy feet straight down!! Retrace your steps back down the trail, past the mine entrance, and back to the intersection with the Highlands Trail. Turning left returns you to the parking area, while turning right takes you along the rest of the old road before it narrows down to a mere footpath a short distance away. About 200 yards from the intersection is yet another large exploratory pit and piled stone. Across the trail from this trench is an overlook, marked by a large stone firepit, high above the river road below. From here you can look across the Delaware River and see St. Anthony's Nose, an outcropping and overlook on Mt. Weygadt in Pennsylvania. Continuing on the Highlands Trail, a short distance beyond the overlook, the lane ends and the trail narrows down to the width of a rabbit path. If you continue exploring beyond here you might just find the route of the Highlands Trail. If you turn around and return to the parking lot you will have hiked more or less two miles and will have climbed about 375 feet in elevation—not bad if you only had an hour or two to spend!